To most Costa Ricans – Ticos and expats alike – Costa Rican history begins with the arrival of the Spanish in 1502. Recent developments and archeological finds are painting a far different picture however. In fact, there is increasing evidence that ancient cultures thrived in the land of Pura Vida long before European explorers cast covetous eyes upon its beauty and natural riches. Three archeological sites in various parts of the country give an interesting glimpse into pre-Columbian life: Guayabo and La Montana complex in Turrialba, the footpaths of Lake Arenal, and . 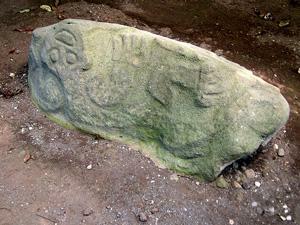 Each site offers a different window into who the ancient Costa Ricans were and how they lived. The first, and probably the most notable, is Guayabo de Turrialba. This 540 acre – which is roughly 219 hectares – site can be found in Turrialba on the southern slope of the Turrialba Volcano. 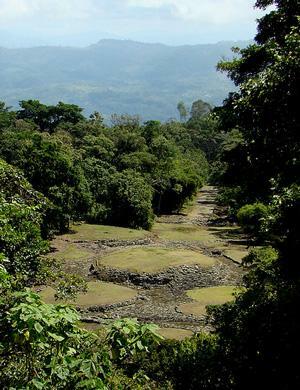 The Guayabo National Park monument was established to preserve the ruins of the city even as archeologists continue to unearth details about the settlement and those who lived there. To date, it is estimated that Guayabo was established and inhabited somewhere around 1500 B.C. During the height of its existence, the city may have held between 10,000 and 25,000 people. For unknown reasons, the settlement seems to have been abandoned by 1400 A.D.-nearly a century before the Spanish arrived. Curiously, no record was left by the Spanish as to whether they had discovered the location and, if so, what condition it was in. Though only about 10% of the site has been excavated, stone streets, various structures, water cisterns and numerous petroglyphs all provide evidence of a vibrant and thriving society. Scientists have also theorized from the drawings that there was a dual power structure-the political chief, known as Cacique and a religious/spiritual leader called Saman. Perhaps as you visit Guayabo, you may be the one to unlock its mysteries. There is also a second location in Turrialba known as La Montana complex. Though not as extensive as the Guayabo settlement, pottery shards found there dated from 1500 to 300 B.C. ; some archeologists feel that these samples must have been pre-dated by even earlier types of ceramic objects-perhaps as old as 2000 B.C. Another location which is far more mysterious in origin can be found near the shores of Lake Arenal. Known for the majestic volcano that stands sentinel over the valley, Arenal became the focus of one Payson Sheets, an archeologist from the University of Colorado. Using NASA remote sensing technology, Sheets discovered the existence of remote footpaths both around and under the current Lake Arenal during these aerial surveys in 1985. These footpaths, some dating back to 500 B.C., lifted a curtain on the life and culture of the ancients who used them as part of their daily existence. Sheets and other behavioral archeologists theorized that wandering bands may have lived around the volcano as early as 10,000 B.C. although a permanent settlement probably did not become established until around 2000 B.C. These early settlers would move away during eruptions and then return to their crops and settlement when Arenal grew quiet. Much like the citizens of Guayabo, these lake residents vanished around 1400 B.C. The belief is that a plague, not the Volcano, is what ended their days.